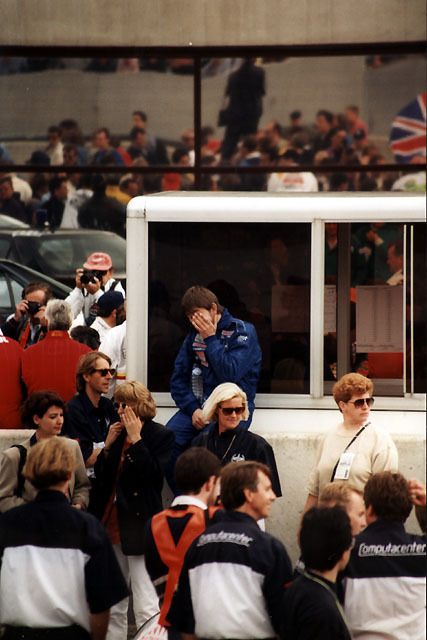 1995 was my tenth Le Mans, but little did the Tourists know of what the weather gods had in store for us when we met up at Ian's home on Friday, 16th June. There were nine Tourists in the team this year, Ian, Alan, Martin, Jim, Peter and myself were joined by Terry, who last made the trip in 1989. The other two were new recruits, Mark and Ian's eldest son Jamie. The weather was very fine when we left Portsmouth on the Normandie at 7.45 on that Friday morning, bound for Caen (Ouistreham). Once we had arrived in France, we journeyed down to our overnight stop near Mayenne, travelling via Thury Harcourt, Conde-sur-Noireau, Flers, Domfront and Ambrieres-les-Vallees. (With apologies to my French friends for the missing accents!!). 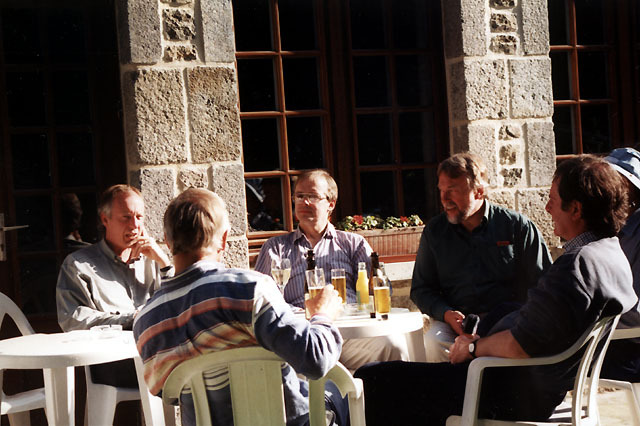 We broke our run at Clecy for a much-needed beer and having negotiated some pretty heavy traffic around Flers, we arrived at the Hotel Restaurant La Marjolaine at around 6.30 p.m. This was one of Ian's "pin in the Michelin Guide" efforts, and on our arrival we thought the building nearby might be the local young offenders institution! Happily, the hotel was excellent and the food and service was even better - one to recommend if you are ever travelling that way, that's for sure! 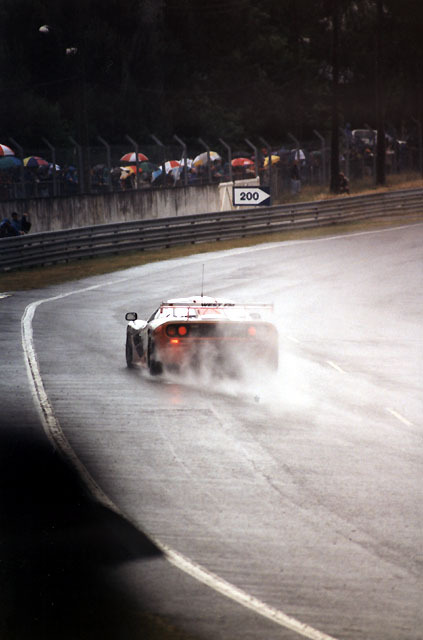 Some of you may realise by now that I have something of a preoccupation with the weather in the lead-up to a Le Mans week-end. Of course, I would still go even if the race was run in the worst weather imaginable, but dry weather, or better still, sunshine is always at the top of my wish list. The atmosphere around the breakfast table on Saturday morning was rather bleak, as the forecast was for rain - guaranteed. It was still dry when we arrived in Le Grand Luce at the Hotel Restaurant Le Cheval Blanc (for the second year running) and the rain was just about holding off when we arrived at the circuit and took up our usual positions on the tribunes for the parade. We knew the rain wouldn't hold off for much longer - a thought almost as depressing as having the two WR "skateboards" on the front row of the grid! I guess the principal interest at Le Mans 1995, well, for me, anyway, was my first sight of the McLaren F1's in action and with six of them in the field, I was looking forward to seeing how they would fare against the prototypes. Inevitably perhaps, I was favouring the Mach 1 Harrods McLaren, run by Dave Price Racing, which had Derek and Justin Bell on the driving strength, together with my "old" favourite, Andy Wallace. The WR's ran reasonably well in the opening hour or so but would shortly be out of the running after delays for one car and a very nasty flip on the Mulsanne for the other (number 8), when it was being driven by Gonin. 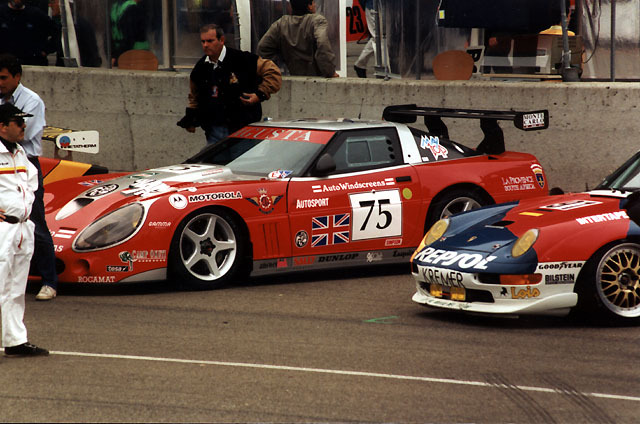 But I guess even these fared better than the much-vaunted Euromotorsports Ferrari 333SP, the engine of which died after only seven laps! By this time the inevitable had happened - the rain was with us, in fits and starts at first but soon more heavily. So we did the only thing we could - we took refuge in one of the beer tents! Realising that this was not going to be a brief shower of rain, we decided to move on around the circuit. The rain had depleted the crowds on the tribunes so we walked along them towards the Dunlop Curve. 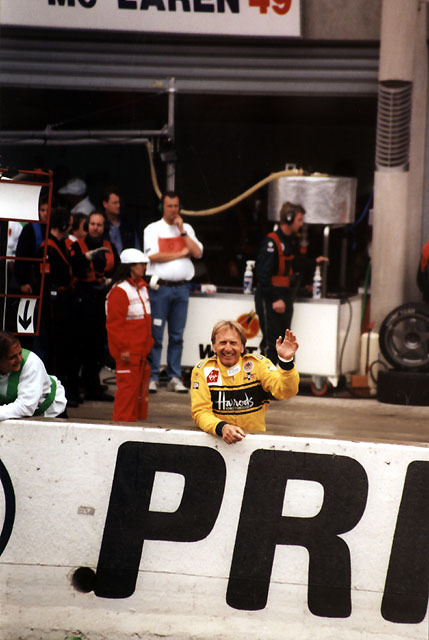 I was delighted to see Derek Bell emerge from his car's pit towards the pit wall, receiving rapturous applause from the crowd as he did so. Son Justin sooned joined him, both of them waiting for Andy Wallace to finish his mammoth triple stint. Photography-wise, the weather was a bit of a let-down. 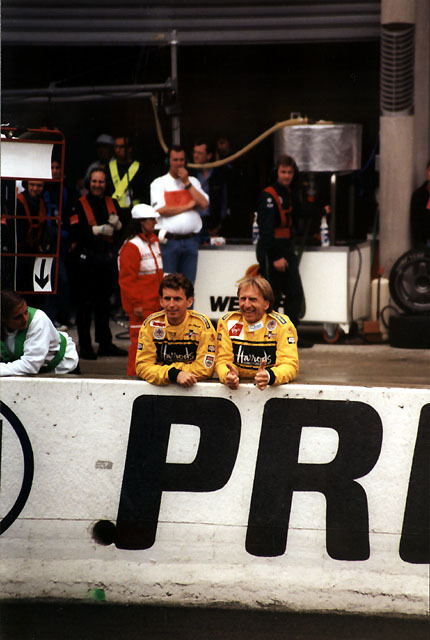 Back in '92, Pierre and I had seats in the Maison Blanche grandstand, so I was able to carry on taking pictures pretty well regardless of the rain, but, with no shelter at all in '95, I used the camera very little in the later afternoon/evening. In fact, these were the only two decent shots I took (at the Esses). We were all suffering in the rain, only one or two wearing wet-weather gear. Ian was worst off, still in shirt-sleeves - he was soaked to the skin! We left the garage rouge for our customary trip out to the Mulsanne to the Restaurant des 24 Heures, and had a beer there while watching the cars over the fences. What a difference to a year ago! In fact, there wasn't too much to see at this time as our visit coincided with the pace-car period following Gonin's accident, so we were having to wait 2 or 3 minutes for each group of cars to appear behind their shepherding pace-car. Eventually we came to the conclusion that enough was enough and headed off for a meal at Le Belinois - another of our regular haunts. As I've probably said before, the great advantages of visiting Le Belinois are clean loos and hot water. We managed to find Ian a dry t-shirt and after a quick wash and brush up we sat down to eat. The food was fine, but the restaurant staff had decided to have one of their go-slow nights as far as we were concerned. 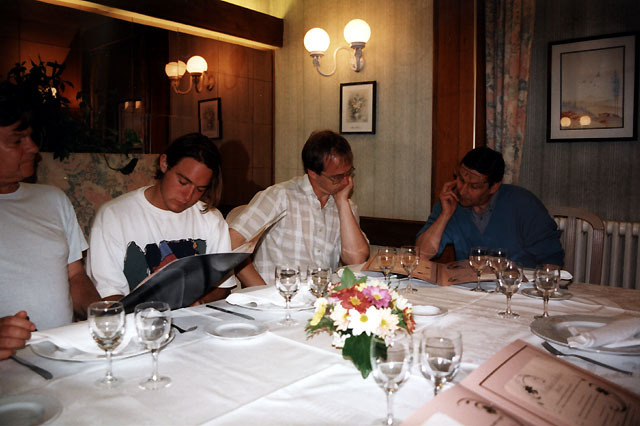 I know that meals tend to be rather more leisurely in France, but this one went on and on. (It isn't always like that at Le Belinois - this year (2001) we had a fantastic meal there with superb service - and they're not paying me to say it!!). When we left Le Belinois the rain was still falling quite heavily, and for the first time in 10 years at Le Mans, I began to wonder if I would be better off returning to Le Grand Luce with the others instead of going back to the circuit. However, the thought didn't linger for long!! I had already missed too much of the race and as radio reception had been almost non-existent in the restaurant, I had a lot of catching up to do!